Mix all batter ingredients. Make batter like dosa. 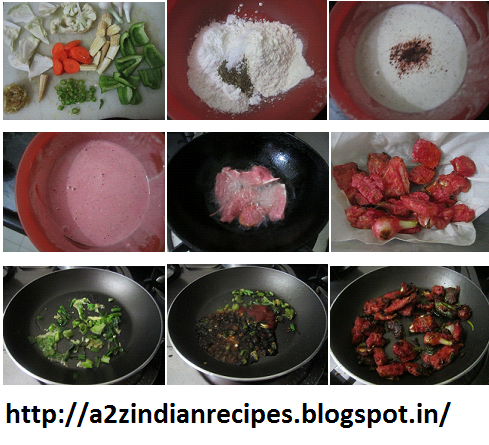 Dip vegetables in batter and deep fry till it becomes crispy on medium flame. Keep it on tissue paper to remove excess oil. Heat the remaining oil from kadai i.e. 2 tbsp in a pan, add ginger garlic paste, saute for a minute. Then add chopped spring onion, saute for a minute. Then add soya sauce, vinegar, chili sauce, tomato ketch up, sauté for a minutes. Then add fried vegetables, toss very well on high flame for a few seconds. Switch off the flame. Serve hot.